SYDNEY, Australia, January 15, 2017 (ENS) – Hours after Australia’s Prime Minister Malcolm Turnbull smiled for a photo with Japan’s Prime Minister Shinzo Abe in Sydney on Saturday, Japanese whalers were caught killing whales in the icy waters of the Australian Whale Sanctuary off Antarctica. After five weeks of searching the Southern Ocean, a ship from the nonprofit Sea Shepherd Conservation Society has located the Japanese factory whaling vessel in the Australian Whale Sanctuary with a dead minke whale on its deck. 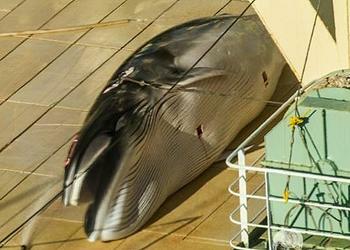 These are the first photographs documenting the Japanese whalers’ killing of whales since the International Court of Justice ruled their whaling program illegal in 2014, and the Australian Federal Court found the Japanese whaling industry in contempt for killing protected whales in the Australian Whale Sanctuary. The Nisshin Maru factory ship was spotted by the helicopter of Sea Shepherd’s MY Steve Irwin at 12:34AM GMT (11:34AM AEDT) at a position of 64 57.6S – 085 09.6E, within the Australian Whale Sanctuary. When the helicopter approached, the Nisshin Maru crew rushed to hide the dead whale with a tarp, while the fleet’s harpoon ships Yushin Maru and Yushin Maru #2 covered their harpoons. Sea Shepherd’s helicopter has relayed the whaling fleet’s position to the MY Steve Irwin, now on an intercept course with the factory ship. “No more whales will be killed today,” said Meyerson. 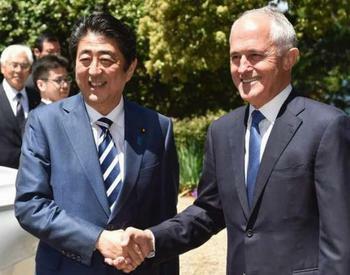 The Japanese and Australian leaders made no public statement about whaling and whether or not they discussed the issue is not known. “How can the Australian government ignore these actions when the majority of Australians condemn what they are doing?” asked Lublink. In 2016, Japan killed 333 minke whales, including more than 200 pregnant females, in the year’s Antarctic whale hunt, according to the Institute for Cetacean Research. The 2016 hunt took place without regard to the International Court of Justice’s 2014 ruling that challenged the scientific legitimacy of the program. 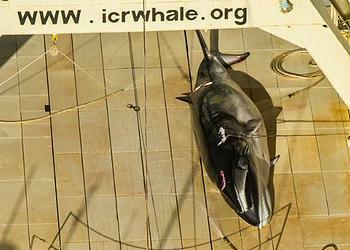 Operation Nemesis is Sea Shepherd’s 11th Antarctic whale defense campaign. In Sea Shepherd’s past 10 campaigns over 6,000 whales have been spared the grenade-tipped harpoons of the illegal Japanese whaling fleet. Japan’s so-called “scientific research” program used to justify the killing of whales has been rejected by the International Court of Justice and the International Whaling Commission’s scientific committee. In 2015 the Australian Federal Court fined the Japanese whalers $AU1 million for hunting within an Australian whale sanctuary, however this fine remains unpaid. In July 2015, the Sea Shepherd was fined US$2.55 million for harassing the Japanese whaling fleet. This fine has been paid to the Institute for Cetacean Research, ICR, the Japanese organization that claims to be a research organization specializing in the “biological and social sciences related to whales,” and Kyodo Senpaku, a Japanese company that conducts the collection, processing and wholesale of the whale byproducts on behalf of the ICR.